In their ongoing mission to defeat the terrorists, the Department of Homeland Security (DHS) has suspended the constitutional rights of 200 million Americans with a move that makes Senator Joseph McCarthy seem well reasoned and logical. The Fourth Amendment of the Bill of Rights gives Americans protection against unreasonable search and seizure of their person and property. Just to review, here is the text of the fourth amendment as posted on the U.S. Government's document archive site (source). The DHS has claimed a long-standing right to search people crossing our international borders. Upon superficial consideration, this seems reasonable. But consider the smart phone, tablet, or laptop. These devices contain a person's most personal and sensitive data. If the data isn't stored on the device itself, than the device most likely will provide agents access to data stored online. The DHS claims that these devices can be searched as part of a border crossing inspection. However, these devices contain access to an individual's most intimate and private data. By obtaining someone's device, one gains access to their email, phone records, bank accounts, photos, documents, and other private data. Therefore, searching one's laptop, tablet, or smartphone is not the same as searching their pockets and briefcase. In fact, searching an electronic device is more analogous to searching their entire home, office, and car all at once. By looking through a device, border agents can review and seize any and all of that person's private information. An easy solution would be to only carry "dummy" devices when traveling internationally. For example, I can take a laptop with no personal data on it, and access my data online when I arrive at my destination. I can also encrypt my data, so if my computer is seized at the border, agents will only be able to see a scramble of nonsensical 1s and 0s. Unfortuately, border searches are NOT limited to the border. The DHS claims that the internal border extends 100 miles inland, and therefore anyone within 100 miles of the border can be searched without probably cause and without a warrant. .66% of our nation's population (over 200 million people) lives within 100 miles of the border, and are therefore subject to search and seizure of their electronic devices and data at any time and place without a warrant. Here is the ACLU's map of what it calls the "Constitution Free Zone". 2 out of 3 Americans live in this Constitution Free Zone. Do you live in it? Most of us do. 99% of Californians do, as do 88% of Arizonians. 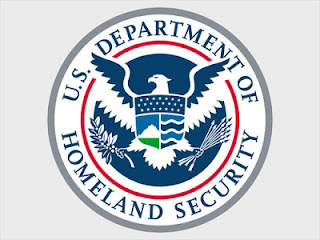 If you live in Connecticut, Delaware, Florida, Hawaii, Maine, Massachusetts, Michigan, New Hampshire, New Jersey or Rhode Island, then your entire state is a DHS search and seizure zone. So, you know, good luck with that. Therefore, most of us no longer have the right to avoid unreasonable search and seizure. So if and when you see those flashing reds and blues in your rear view mirror, and you're in the orange section on the map above, you'd best start deleting your hard drive and smart phone memory. Unless, of course, you are ok with the government having access to your entire digital life including your banking info, email, web browsing history, and location data. I, for one, do not consent to waive my 4th amendment rights. I have nothing to hide, but as the founding fathers intended, the U.S. Government cannot require me to prove that. Thanks to Darlene Storm, whose ComputerWorld article on this topic inspired mine. Read her article here.